Benjamin Hedrick (1827-1886), a chemistry professor at UNC, was dismissed from his job in 1856 after openly claiming that he supported the Republican presidential candidate and opponent of slavery, John C. Fremont. The North Carolina Standard launched an attack on the professor, which contributed to his dismissal and incited violence against him that made it necessary for him to flee the state in 1856. Hedrick's treatment exemplified the tensions concerning slavery in the state of North Carolina before secession and the Civil War. Benjamin Sherwood Hedrick (1827-1886) was born and raised in Davidson County, North Carolina, the oldest of seven children to John and Elizabeth Hedrick. Benjamin's father was the descendant of German immigrants and a fairly prosperous bricklayer and farmer. As a child Hedrick received very little formal education. Thus his mother provided his early schooling until her death in 1842. Following her death he enrolled in the Lexington Classical School in Davidson County, which prepared him for his days as a student at the University of North Carolina (UNC). 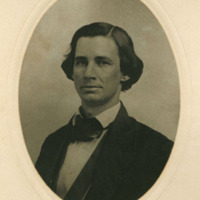 Hedrick excelled at UNC and graduated with honors in 1851. University President David L. Swain recommended Hedrick for an appointment to a position in the prestigious U.S. Nautical Almanac Office in Cambridge, Massachusetts, where he worked for two years. While living in Massachusetts Hedrick attended Harvard University's Lawrence Scientific School, where he studied chemistry and mathematics. Prior to living in New England, Hedrick had been a supporter of the Democratic Party, but by 1854 his political affiliations changed to the northern based, anti-slavery Republican Party. His political affiliations led to severe problems only a few short years later. His education at Harvard led him to return to North Carolina in 1854 when he accepted a professorship at UNC teaching agricultural chemistry. After only two years of teaching at UNC, Hedrick's Republican affiliations in a Democratic-dominated southern state would lead to his dismissal and flight from the state. In 1856 it became known that Hedrick supported the Republican, anti-slavery, presidential candidate, John C. Fremont. As word of his political affiliations spread the state's leading Democratic newspaper, the North Carolina Standard began publishing editorials that attacked the professor. In response to these verbal attacks, Hedrick, against the advice of his friends, published a defense of his political position in the Standard. His defense highlighted the complicated issue of pro-slavery and anti-slavery arguments found within the nation. Hedrick was far from being a radical abolitionist. Instead of advocating the nationwide abolition of slavery, Hedrick only opposed the westward expansion of the institution. While Hedrick did not own slaves, both his father and brother did. Hedrick argued that the expansion of slavery and the interstate slave trade was economically hurting North Carolina. Hedrick's attempted defense only fueled the fire burning against him. In response to public outrage the university dismissed him in October 1856. Following mob action and threats to tar and feather the former professor while attending an education conference in Salisbury, North Carolina, the professor was forced to flee the state. Smith, Michael T. "Benjamin S. Hedrick and Dissent in Civil War Era North Carolina." Thesis, North Carolina State University, 1999. Miller, Jennifer , Benjamin Sherwood Hedrick, 1827-1886, Civil War Era NC, accessed April 24, 2019, https://cwnc.omeka.chass.ncsu.edu/items/show/231.